I Wish I’d Learned to Play Guitar by Melissa Bartell is licensed under a Creative Commons Attribution-NonCommercial-NoDerivatives 4.0 International License. You still can. It’s not too late for next year if you start now. You’ll need lots and lots of practice. I mean lots. At least 15 mins every day doing the same thing. Aww. I’ve been there. It’s not too late! I suppose I ought to be trying to tempt you to the ukulele side, given my latest entry, but the heart wants what it wants. 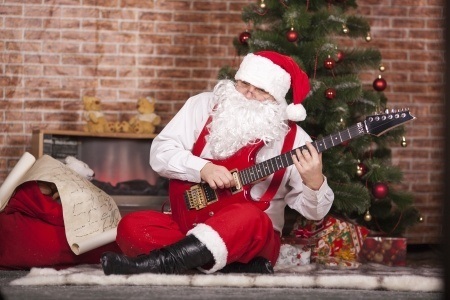 I hope you get a guitar! I got an electric guitar for $20 at a flea market. Might I suggest you try looking around at those? Getting a guitar for not super expensive* is totally doable, and then there’s justinguitar.com for lessons. * though while I paid $20 for the guitar, the supplies were not so cheap. I should probably go back to trying to learn again. I took some lessons IRL and found them to be super intense and kind of burned out trying to learn 4 songs in 6 weeks as a total noob….I gather web lessons are more my speed.